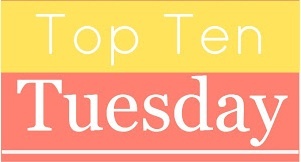 Top 10 Tuesday is a weekly feature of The Broke and the Bookish. A full list of instructions and future themes can be found here. 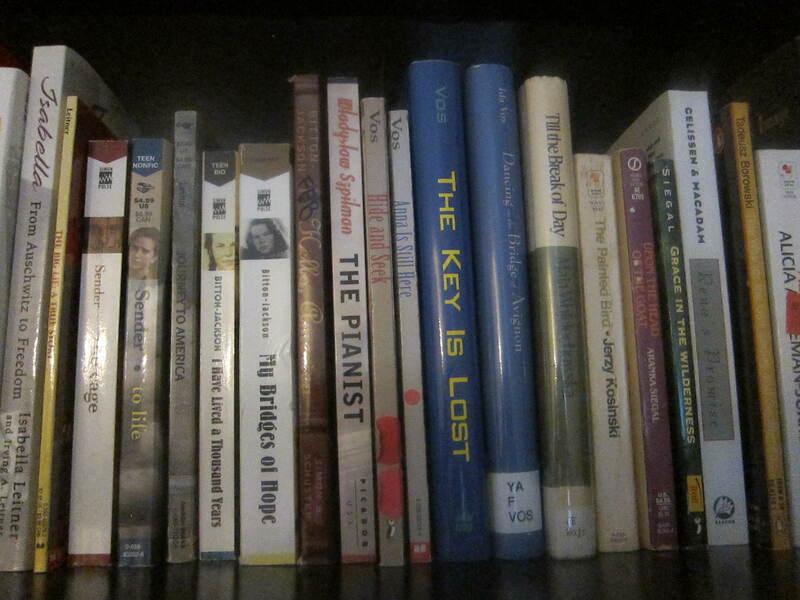 This week’s theme is Ten Authors I Own The Most Books From. I’m going to do my list as a photo montage, since I love photography. As much as I love the late Mr. Uris’s historicals. I have to be honest and admit he wasn’t the world’s greatest writer. He was an awesome storyteller and did amazing historical research, but subtlety wasn’t exactly his strong suit. I see him as an average to slightly above average writer who had a very good editor. Even in spite of his editor, though, he still needed to step away from the exclamation point key and make his heroes more realistic instead of so good-looking, very tall, and larger than life. 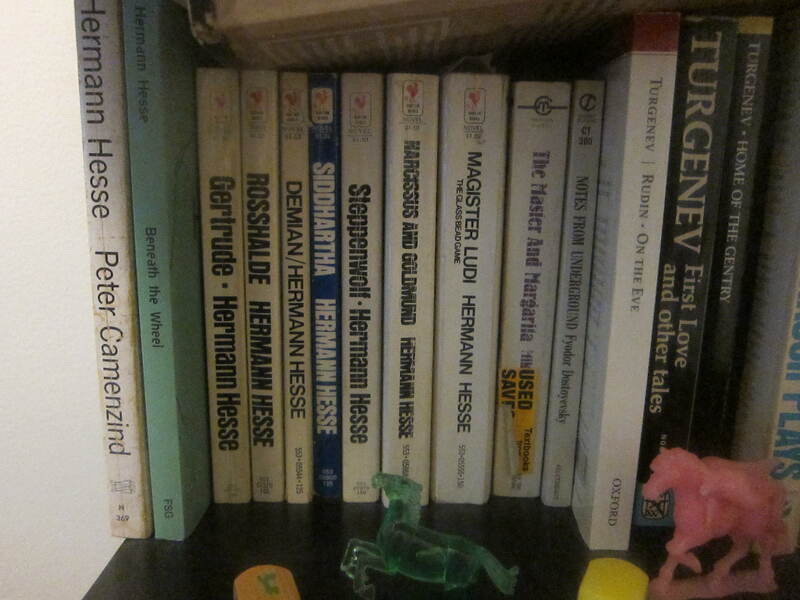 Hermann Hesse is my next-fave writer. 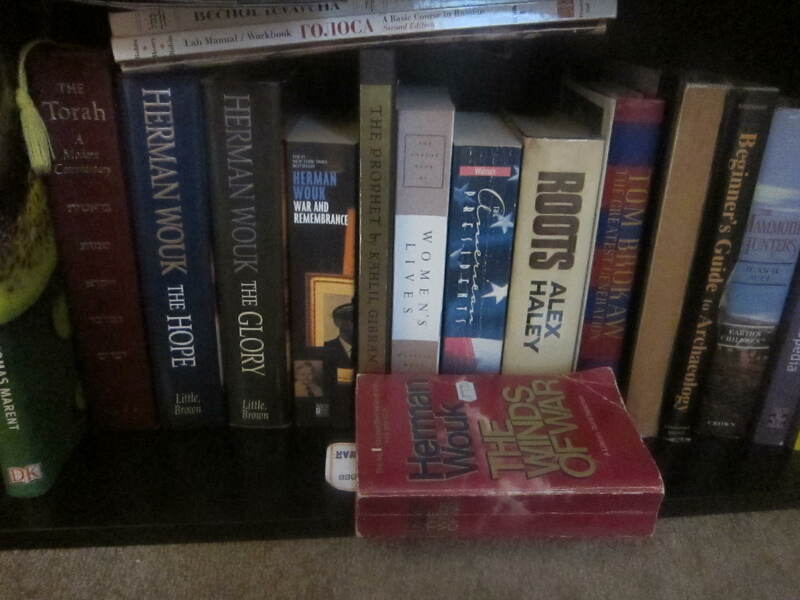 I’ve read all his novels and some other prose, though I don’t own all of his books yet. 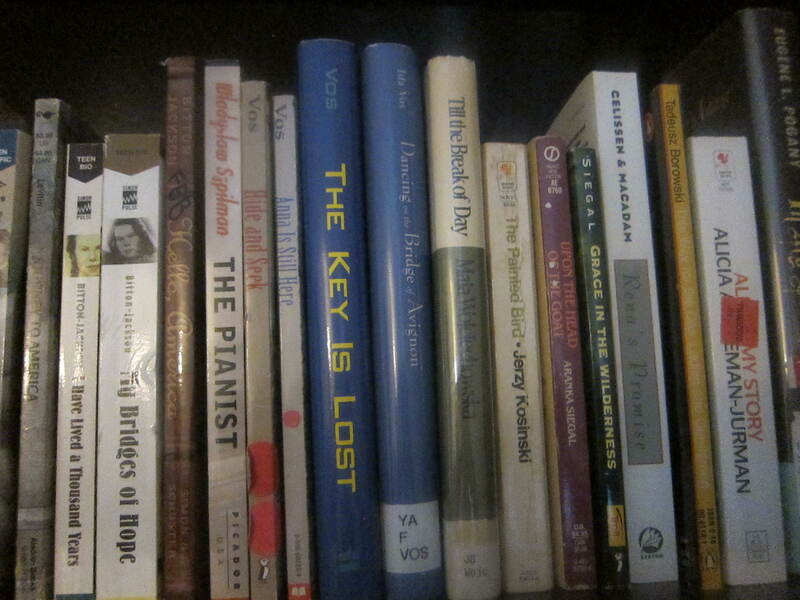 Missing from my shelf are Knulp and The Journey to the East, and his collections of stories and essays. I found these in the free bin at one of my local libraries, and thought they’d be great potential resources for researching the Marine chapters of my WIP. 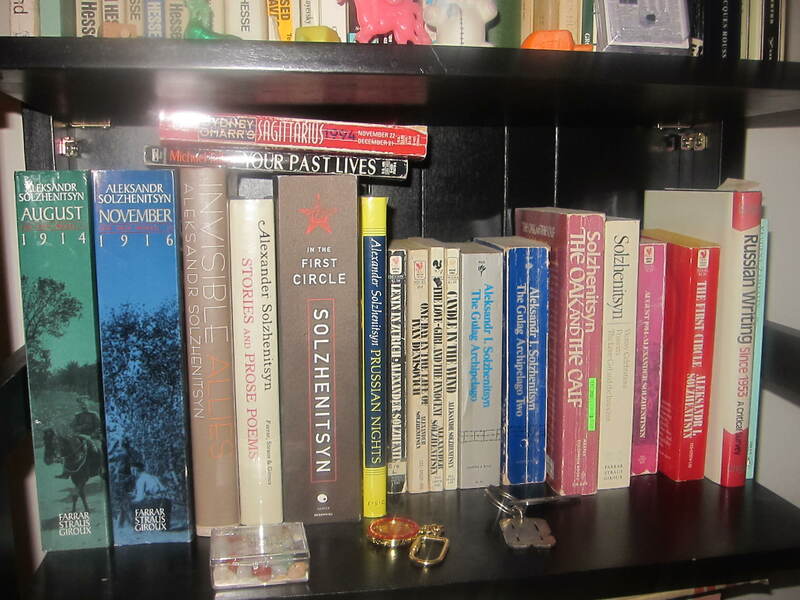 There are a couple of authors represented several times on this section of the shelf, and if you’re wondering, yes, I have a lot more Shoah memoirs and novels on other shelves. With all due respect to Ruth Minsky Sender, however, I just didn’t find her memoirs as compelling or interesting as most of the other Shoah memoirs I’ve read. 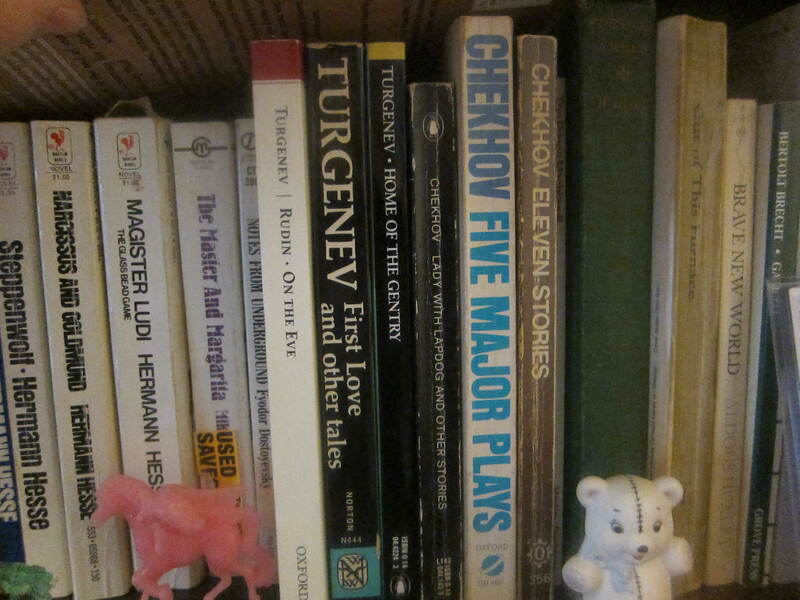 Anton Pavlovich Chekhov is my third-fave writer, and Ivan Sergeyevich Turgenev is my fourth-fave writer. The old green book is a 1944 printing of Kathleen Winsor’s Forever Amber, with the text printed on two columns on thin pages. I assume it was because of wartime paper shortages. 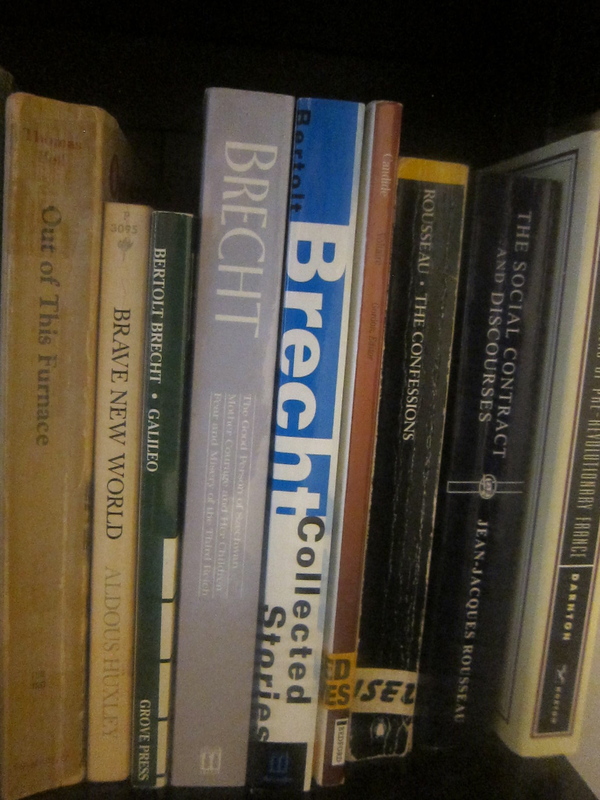 I love Bertolt Brecht. I even did my big literature paper in my twelfth grade English AP class on him. 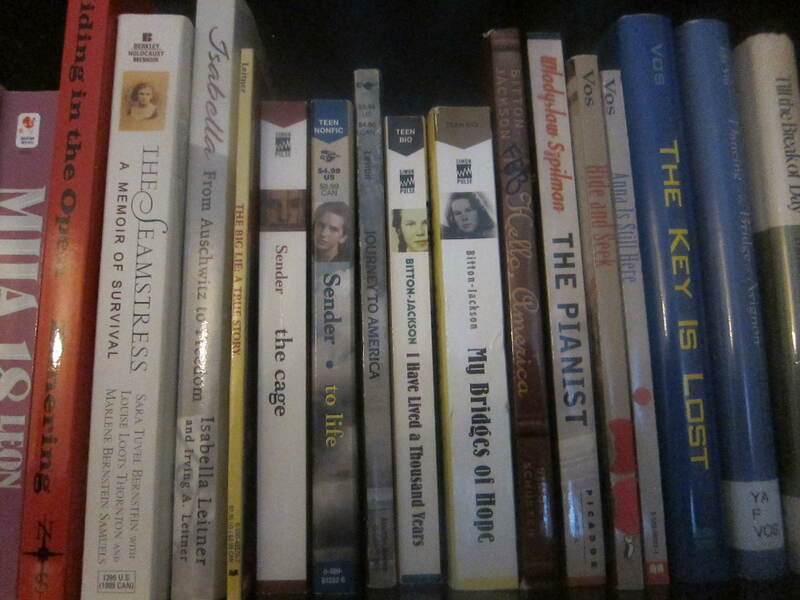 This shelf also contains one of the biggest steals I ever got, Jean-Jacques Rousseau’s awesome Confessions, which I got for only fifty cents at a library book sale. Someone there joked I should have to pay more since it’s such an intellectual book. 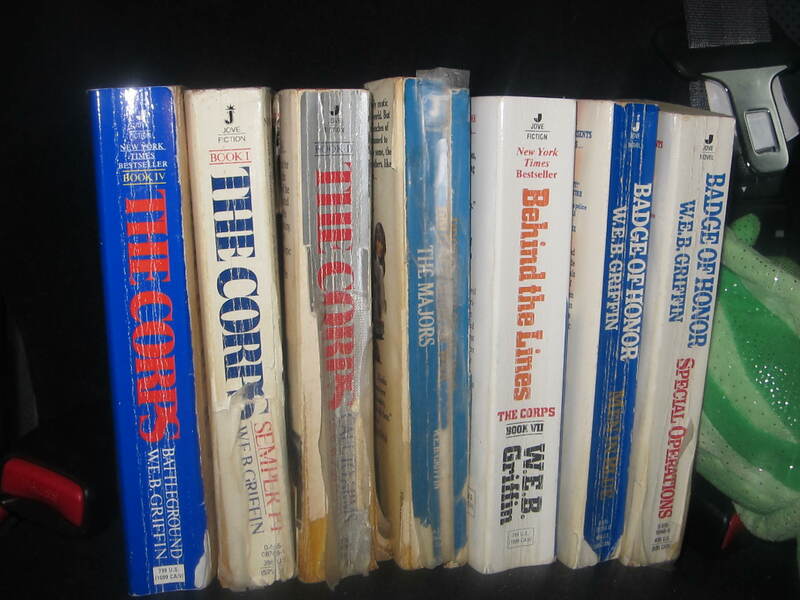 I’m currently reading The Winds of War, after having my reading of it interrupted very prematurely in the wake of my car accident eleven years ago. I got it for a buck at Mystery Train Records in Amherst, Massachusetts. This is the kind of historical I’m used to reading, and which I base my own writing on—ensemble casts, third-person omniscient, more about the journey through dramatic historical events instead of fast-paced and plot-centric, hundreds upon hundreds of pages. 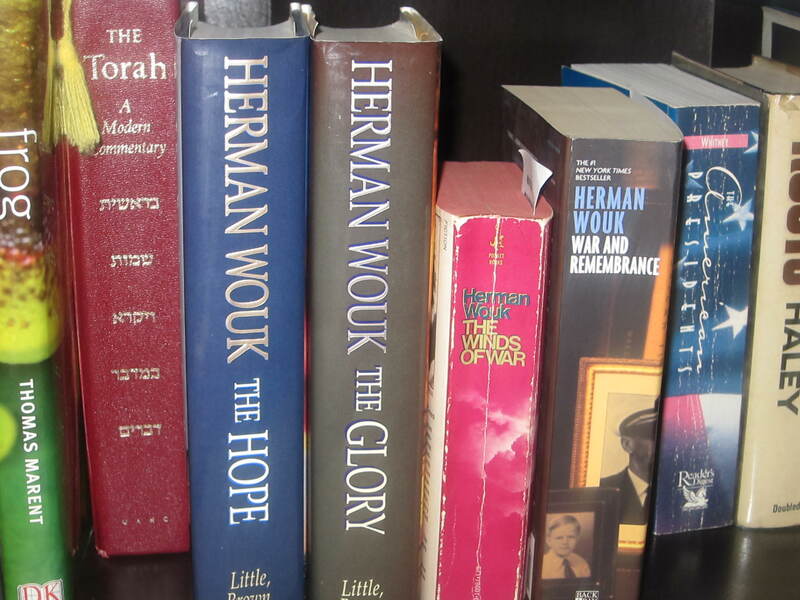 May the 99-year-old Mr. Wouk live and be well! I’ve also got some repeat authors in storage by my parents’ house, like Ann M. Martin and Laura Ingalls Wilder.